The Eze-Igbo in Kaduna State, Igwe Sylvanus Aneke has said that his life and that of other Igbos in North are in the hand of God. He insisted that Igbos in Kaduna were not planning to vacate on the instruction of coalition of Arewa youths. 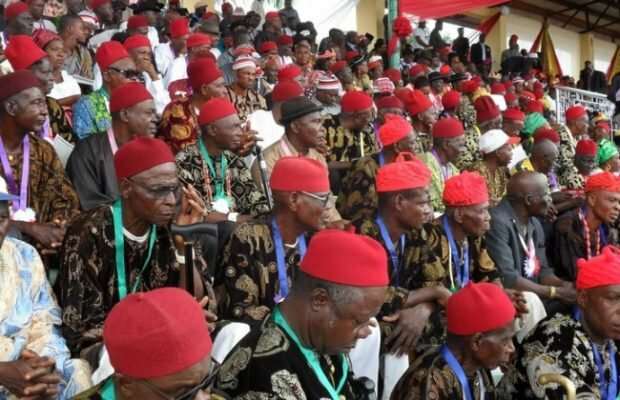 Igwe Aneke said Northern youths were too insignificant to tell Igbos to quit the North because of a group of people agitating for Biafra in the South East. He told Sun in an interview, “We are not thinking of doing that. There is freedom of movement but we know that our people are not planning to move. “We cannot tell whoever wants to move not to move; but we know because we’re being assured, we listened to Arewa youths, we also listened to responsible Arewa citizens and elders. “They’re not saying the same thing. So why must it be that of the youths we should take? “We were with the governor of Kaduna State, we know the assurances he gave us. “We were with the Kaduna State Commissioner of Police, we know the assurances they gave us. Do you think we should ignore all these ones and then obey the command of the Arewa youths? “We cannot say nobody should move but we know that unless the Lord watches over a city, the watchmen watch but in vain. Our lives are in the hands of God not in the hands of any man.